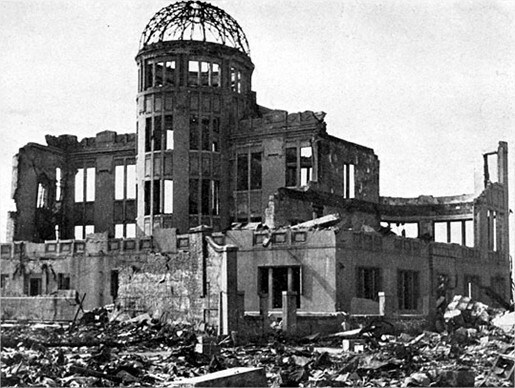 Today marks the 70th anniversary of the atomic bombing of Hiroshima — followed three days later by the bombing of Nagasaki. While the world is now aware of the horrifying aftermath of these events, this wasn’t always the case. This is the first in a three-part series on the US’s decades-long deliberate effort to hide the true extent of the atom bombs’ mass devastation. In June of 1946, Lt. Daniel McGovern hauled 90,000 feet of color footage to the Pentagon and submitted it to General Orvil Anderson. Locked away and declared top secret, it did not see the light of day for more than thirty years. The first in a three-part series. 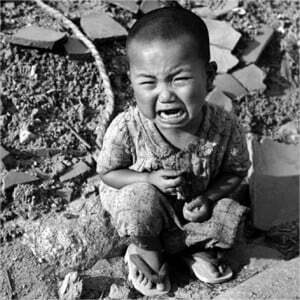 As our nuclear arms race with the Soviet Union escalated, all that most Americans saw of Hiroshima and Nagasaki were the same black-and-white images: a mushroom cloud, a panorama of emptiness, a battered building topped with the skeleton of a dome—mainly devoid of people. Once top secret, the shocking images now carry an “unrestricted” label. You have, quite possibly, seen a few seconds of clips on television or in film documentaries. If so, those images may be burned into your mind. Yet no one was allowed to view them when the horror they captured might have prevented more horror by slowing down or even halting the nuclear arms race. Compounding the cover-up, the American military seized all of the black-and-white footage of the cities shot by the Japanese in the immediate aftermath of the bombings. They hid the film away for many years. It was known in Japan as the maboroshi, or “phantom,” film. It, too, rests in the National Archives today. “Never again.” At least not with outmoded bombs. Not incidentally, those planned tests were designed to help the U.S. military build bigger and better nuclear bombs. Greg Mitchell is the author of more than a dozen books, including “Atomic Cover-up.” He is the former editor of Nuclear Times and Editor & Publisher and writes a daily column at The Nation.